(A welcome from the Show Chairman, David Skipton). This show that you're attending is something very special indeed. It is the second solo Rossica Society show in this country (the first having been held in 1938 at the New York YMCA), and counting the one in Belgium organized by A.M. Rosselevich in 1954, it is only the third ever for our Society, now over half a century later. Important as those two shows were to Rossica, they pale in comparison to this one. This event is the celebration of a rich philatelic history, an occasion to honor some of those pioneers who explored and promoted it, and a tremendous opportunity for our Society to showcase not just the stamps and the stationery, the postal history, postcards, themes, revenues and vignettes of Russia and her people, but those of other countries whose histories have overlapped with hers, often tragically: the Baltic States (represented here by Latvia and Lithuania), Finland, Poland, Ukraine and Carpatho-Ukraine, the Caucasus States (featured in this show by Armenia), Persia and Mongolia. ROSSICAPEX 2009 presents a glorious array of material that demonstrates what makes collecting in these fields so challenging and rewarding: the incredible depth, breadth and detail to be found in our corner of the hobby. We owe this golden opportunity and our heartfelt thanks to the American Stamp Dealers Association, Inc. (ASDA), which has graciously provided us with the space, frames, security, advertising and technical support necessary for an event of this nature, and it has generously subsidized the Awards Banquet, paying over half of the total cost. Without the ASDA's support, an exhibition of this scope for us would be inconceivable, for the Rossica Society has neither the large membership nor the deep pockets to host an exhibition such as this on its own. 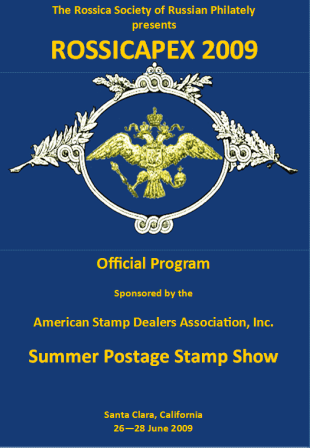 We are also very grateful to the American Philatelic Society (APS) for granting national status to ROSSICAPEX 2009. This is a great honor and a major step forward for Rossica, and it puts the Society on the map in a way that would have been impossible had we gone our own way and used "our own judges." Many thanks are owed to our Jury members, some of whom have traveled an awfully long distance to help make ROSSICAPEX a success. They are: John Hotchner, Ron Lesher Sr., Ross Marshall, Steve Schumann and Jussi Tuori, all APS and/or FIP judges with considerable expertise in Russian and related-areas philately and long experience in judging at the national and international level. We also greatly appreciate the tremendous support we have received from other philatelic organizations (most notably the Reno Stamp Club, the Council of Northern California Philatelic Societies and Filatelic Fiesta) and individuals who have contributed their time, energy, advice and awards to this event. Their generosity is a most welcome enhancement of and a big lift to all the effort that has gone into ROSSICAPEX 2009.